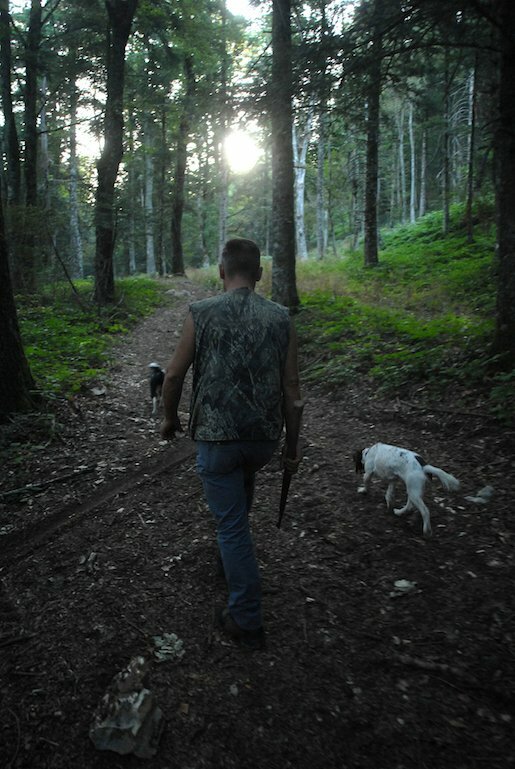 Truffle hunting in Molise, the second biggest producer of truffles in Italy! A morning of truffle hunting in Molise, the second biggest producer of truffles in Italy! Molise is the second biggest producer of truffles in Italy! Ottavio is from the contrada of Carovili, near Angone. When you mention his name the Agnonese say, ‘who?”. 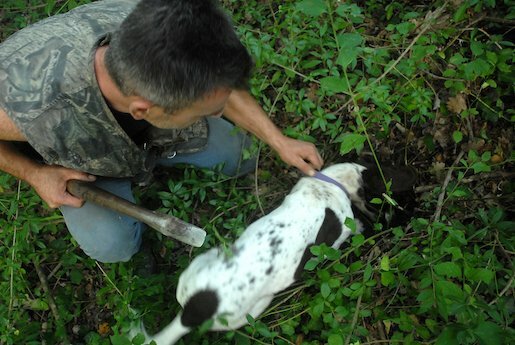 “The guy that hunts truffles,” I say, “Oh him, Ottavio, from Carovill”. Ottavio has lived in Agnone for at least a generation but he will always be from Carovilli, and so will his children. That’s the way it is here. (The master cheese makers, the family Di Nucci have lived in Agnone for 3 Generations, but they’re from Capracotta). With his very well trained dogs, Eva and Kira, and a special licence in his back pocket, Ottavio goes out every day in the season, May to the end of August and then mid October till the end of January. The dogs have regular checks and are pristinely healthy – they take the truffles in their mouths, so they can’t be sick or ailing. Eva is a springer spaniel, her baby, Kira is mixed breed. With loads of experience, Eva did most of the hunting, Kira is still learning. It takes 4-5 months to train a dog and practise is key. We went out at 6am when the dawn was just breaking, but Ottavio had already been out earlier with a head-lamp and had a fair haul. Truffles are found in patches, close to large trees, but with little or no ground cover. It was a beautiful day once the early chill wore off and lovely to get deep into the woods. One or two of Ottavio’s favourite spots had been ‘done’ when we got there, probably not by another professional, but someone out to find a private stash for his pasta. Molise is the second biggest producer of truffles in Italy and these are prized. The most common type is scorzone, which grows both in winter and summer. The bianchetto grows between January and March. The two most prized varieties are Nero preggiato and Bianco, which grow between October and February. The dogs know just where to find them, their sense is very keen and although the Scorzone sit just below the surface of the soil, the bianco are deep and can take some digging; sometimes so deep it’s incredible they find them at all. 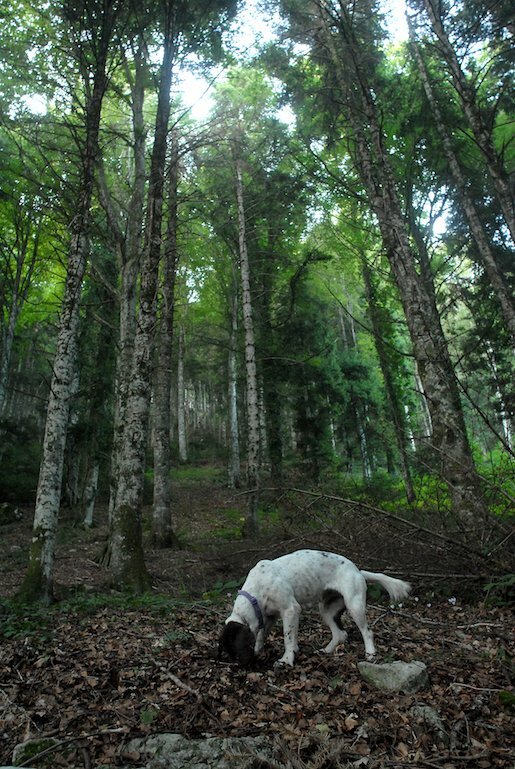 There has been a lot of tree felling in the region, not good for truffles, and Ottavio now has to go deep into the woods. Scorzone fetch about €1000 per kilo, but they don’t weigh much, so that can take a while. The bianco, much rarer, fetch more like €4000 per kilo, but that’s not to say the scorzone are inferior, most chefs prefer them. Ottavio’s truffles get sold to restaurants mostly – there is quite tight regulation on this too, and you can’t just sell them anywhere. Most of Molise’s truffles get made into crema or olio di tartufo, and other types of pasta sauces. But there is nothing lovelier than taking a fresh truffle, wiping it gently clean and then shaving over a bowl of fresh home-made pasta!